Add several processes to break and improve coal to make it more valuable and useful in game. Add more than 30 new buildings, 100+recipes and ingredients. This mod is not compatible with Angel´s mod yet, but it wont cause any bug, just duplicates. Setting up the base mod for future expansions, this mod will turn the game more hard a bit and heavily focused on coal and steel. Advance and unlocks new fuels and generators to feed your base with constant high-supply turbines (that will stand until you keep them fed). Extract everything you can from coal and plan well, since your base wont be small! If you have Bob´s suit installed, it will be way more harder! It recommended the use of any loader mod to feed some of the high consuming machines. 0.4.0 = Added Russian locale. Added 3 new fences. Fixed small bugs. Cooling towers now condense all ranges of steam temperatures. 0.5.0 = Balance some recipes. Rectisol, Filter and Evaporators have their pipe connections reworked. Removed niobium-pipes, tiles and tanks.Compatibility with PYFE added. - Converted Niobium and Borax to minable ores. So now they spread around the map and must be mined with their own mining drills. - Added compatibilities with the new pyHightech Mod. 1.0.6 = Few balances, fixed fluids. 1.0.8 = Few balances, fixed advanced foundry recipes. 1.0.11 = Added mk01 to mk04 versions of industrial buildings to be unlocked only under pyRO. Lots of balances and optimizations. Last edited by pyanodon on Sun Feb 04, 2018 11:01 am, edited 57 times in total. You say cleaner energy, do you mean nuclear? Anyway, keeping an eye on this. Cheers. Last edited by ZombieMooose on Mon Apr 03, 2017 3:15 am, edited 1 time in total. diongham wrote: You say cleaner energy, do you mean nuclear? Oh.. nono. Nuclear will come in the vanilla game if i remember well. 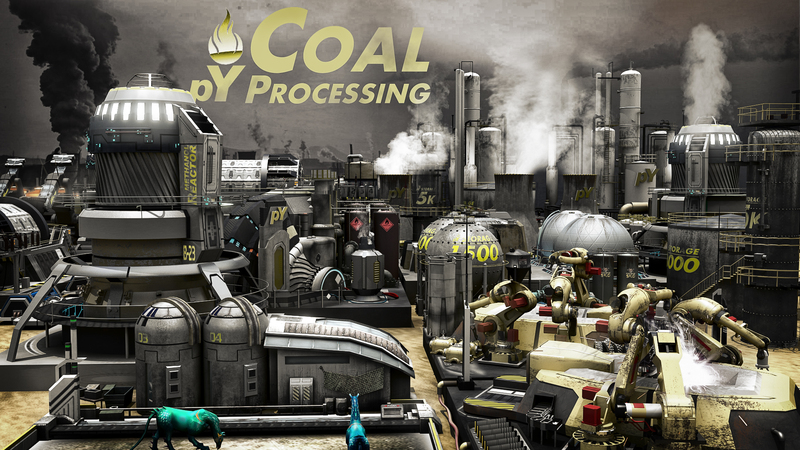 The goal in this mod is use actual knowledge of coal processing and a bit of scifi to generate energy from coal with very low emissions in late game with a big production chain. Is what people call today as "green coal". From the use of syngas to CO2 storage etc. Last edited by pyanodon on Wed Sep 07, 2016 5:57 pm, edited 3 times in total. Thank you! I will update the file with that. Thanks to you my friend! Now let´s see if i can make it compatible with your mammoth mod! At last we get some nice things to do with all the coal after solar empire has raised. question - we can do iron by processing coal? Hahah solar empire will tremble with the raise of CO2 storage!! Hahaha. Thank you. Last edited by pyanodon on Wed Sep 07, 2016 5:54 pm, edited 1 time in total. Yes... but very few. If you burn the iron oxide in any furnace, you will get iron ore. 1:1. Not enough to sustain a base, but will helps since coal have small parts of iron on it and the destructive destilation column can extract that lil iron. Is the 8.9MW flare stack a bit OP? steinio wrote: Works also in 0.13. Yes, it is. But that turbine eats a lot of syngas too. Next release i will do some balance things in that production. I don't get a stable power supply without supporting steam engines for your factories but nearly 9MW feels to high comparing to a steam engine with 512kW. Do you have ideas for more recipes for creasote. Didn't hear from it before today. How about some tar tiles for roads? steinio wrote: Yes you are right. Humm.. so you must produce more syngas to burn in that turbines. Try store in a tank, the turbine's consuption and pollution generation are variable with the power necessity. Next release will balance it better. With blue science, creosote can be refined into crude oil in a very low yield and other recipes. With green science, Tar can be break into some syngas and use a special building to extract few minerals from it. The idea of using tar for roads is nice, i will add it in my schedule to transform tar into asfalt. Thanks for your suggestions, was useful. Last edited by pyanodon on Thu Sep 08, 2016 2:55 pm, edited 2 times in total. I don't care about pollution but this seems also a bit low for burning gas. - Energy generation of MK01 gas turbine was cut in 1/3. - Iron oxide production cut in a quarter because it´s a subproduct of destructive distillation of coal. - Coke production was reduced too since it burns better than coal. Some important note: I making the second step in this mod to bring unlocks with the green science tier. So, to do that, i will need some ingredients that´s present into Bob´s intermediates. This mod will have that dependency in the near future when i release the 0.2.1 version. So keep that in mind when upgrading later. I will announce it better when time comes. Steinio gave me that great idea of making asphalt, so it was added in my schedule. This is looking spectacular! Can't wait to see this evolve! I've not used any of the Bobs mods yet, so not sure what they do... What impact does installing Bob´s intermediates have on the game? Last edited by aklesey1 on Wed Oct 12, 2016 6:32 pm, edited 1 time in total.